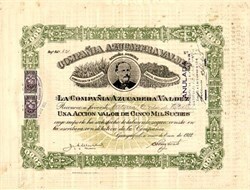 Beautiful certificate from the Compania Azucarera Valdez issued in 1922. This historic document was printed by Artes Grailicas and has an ornate border around it with a vignette of the company's founder. This item has the signatures of the Company's President and Secretary and is over 95 years old. There are also 2 old tax stamps attached to the certificate. Compania Azucarera Valdez - Ingenio Valdez, is the oldest sugar mill in the country. Its sales represent 33% of the sugar market sales in Ecuador. With a total area of 14,000 hectares in plantation, the company owns 75% of the land and 25% belongs to sugar cane planters. Ingenio Valdez has a milling capacity of more than nine thousand tons of cane per day. It is the most efficient sugar producer with the best sugar/ton yield in the country, reflecting the company’s leadership in sugar cane extraction. On Jan 31, 2006, the Ecuadorian sugar manufacturer Compania Azucarera Valdez ended the period with an output of 3,146,000 sacks of sugar. At present, the company employes more than 3 350 people at its 14,000 hectare property. Of the total, 10,000 hectare is used for the cultivation of sugar cane. Valdez mills 50,000 metric tons weekly. Guayaquil is a port city in Ecuador, known as a gateway to Pacific beaches and the Galapagos Islands.